SuperValu has a 130 year history starting from the Minneapolis/St. Paul, MN – USA. As of 2010, SUPERVALU handles 15 percent of the nation’s food distribution business, and is the third-largest grocery retailing company in the U.S.
Super Value Grocery Chain started as the combination of B.S. Bull and Winston and Newell Company, the direct parents of SUPERVALU®. Originally started in the Minneapolis/ St. Paul, Minnesota region, SuperValu rose to the top by being innovative and progressive with their food handling methods. They were one of the first companies to have elevators and chutes between floors of their warehouses, and one of the first to offer delivery service via motorized trucks. As early as 1928, Winston and Newell Company was one of the first distributors to affiliate with the Independent Grocers Alliance (IGA). This affiliation, introduced concepts such as self-serve and cash-and-carry. By 1942, Winston and Newell dissolve their IGA affiliation in favor of forming a “virtual chain.” The company offers affiliated retailers a program of services that stresses nationally advertised brands, advice on store fixtures and layout and supported advertising. In return, retailers operate under the SuperValu and U-Save names. It was 1954 when Winston and Newell change the company name to SuperValu, more closely aligning the company with its successful retailers. Two years later in 1955, they acquire 12 regional food wholesalers, primarily in the Midwest, Southeast and Northwest United States. This distribution business expansion strategy lasts until the late 1980s. Mike Wright is named company president and CEO in 1981, and stays there for more than two decades. SAVE-A-LOT – 1280 stores – Midwest, east of the Mississippi, Maine to Florida, and Texas. Shoppers – 56 stores – Baltimore, northern Virginia and Washington, D.C. 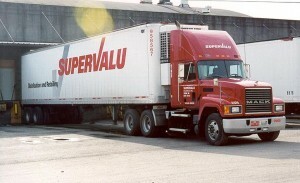 In 2001, Jeff Noddle is named chief executive officer, and chairman of the board of SUPERVALU, following more than two decades of leadership by Mike Wright. Under his direction, SUPERVALU also launches SVHarbor, an Internet-enabled business-to-business portal for affiliate retailers, manufacturer partners and distribution operations. In 2006 SuperValu acquired the Boise, Idaho-based Albertsons, Inc. adding 1,124 stores. With the acquisition of Albertsons SuperValu becomes the third-largest grocery retailing company in the U.S. In 2009, Craig Herkert is named president and chief executive officer of SUPERVALU, following a decade of leadership by Jeff Noddle. Geography: 2,500 stores, in 28 States, including Washington, D.C.
Special Services: SuperValu operates 2,505 food and food/drug combination stores, 878 in-store pharmacies, 117 fuel centers and serves as primary distributor to an additional 2,200 stores. Affiliate Stores: Dierbergs, Festival, County Market, Foodland, Scotts, IGA, Shop ‘n Save, Great Valu Foods Stores. The description should be updated — Supervalu sold Albertsons and all of its subsidiaries a few years ago. Supervalu now only owns Cub Foods, Farm Fresh, Hornbacher’s, Shop N’ Save, Shoppers, and Save-A-Lot. Just wanted to share with you my disappointment on my package of Dakota Growers Lasagna 1 LB package that I purchased at Ekness Supervalue Foods in Crosby, North Dakota on 10/22/14. My husband had asked that I make 2 pans of Lasagna for the guys on his work crew. When I opened the package to boil the Lasagna noodles only 7 of the pasta noodles were not broken up. Therefore, I could only make up one pan the night before, and had to wait till the morning to purchase another box. I am new to the area and decided to purchase this product to support the Dakota’s. Not sure of the packaging/handling process, but wanted to share my disappointment. I just want to tell you that the Stone Ridge Creamery ice cream is an excellent product. It is creamier and better tasting than the more expensive brands that are out there. Thank you for making a delicious ice cream. I shop at Publix in Aiken SC – their customer rep could not locate Culinary Circle Supervalue. Is it possible to contact them to get Culinary Circle’s pizza into their stores. Ask for Denise who orders product. I believe that your pizza could be a big seller here. Response and thanks. I’m trying to locate a brand name company other then Associated Foods. To stock a new start up store in my area. I want to open a store in my area to offer other quality food, and non food items to the community, my local competitors are corner markets, walmart 21 miles away, and 5 small local markets all supplied by associated foods, all 5 stores are within a 45 mile radius one per town. My key location is within this area. I’m able to use my own trucks available to me to pick up products for my store. I’m seeking a major food market supplier. I’m in hopes for your help with supplying me with the needed food and non food items. Or direct me in the right direction other then associated foods. the bonus..I can afford to buy my tomatoes fresh..
Now the question is….Do I want to try this brand again??? My store is The Market Place in Columbia Illinois.. The next question I….Will I hear from You?